Slack users can now use the /lucidchart command to instantly create and share diagrams for quick and easy collaboration. Just type /lucidchart in any Slack channel, and we'll post a link in that channel to a new diagram that anyone on your team can edit. Users can share their diagrams with public Slack channels or individual Slack users from Lucidchart's Share dialog. Click the Add to Slack button below. You'll need to log in or register a Lucidchart account. You'll then be prompted by Slack to grant your Lucidchart account access to enough information to allow us to give you the features listed above. Accept the installation, and you'll be all done! Slack users can use the /lucidchart command to instantly create and share diagrams for quick and easy collaboration. Diagrams created with the /lucidchart Slack command will have a "Back to App" button that automatically sends an image of the diagram back to the Slack conversation. Users can share diagrams directly into public Slack channels from Lucidchart's Share dialog. 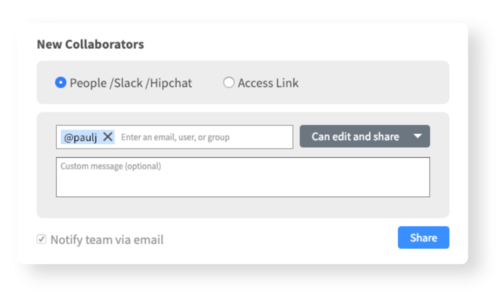 Users can share diagrams directly with anyone on your Slack team from Lucidchart's Share dialog.